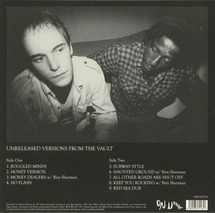 Unreleased archival tracks from the On-U vaults! Serving the same purpose as the recent Return Of The Crocodile set did for African Head Charge, this LP illuminates the early development of one of the flagship acts on the label, allowing some truly magnificent versions to be heard for the first time. Mostly stripped-back raw takes, they highlight the rock solid rhythm foundation laid down by such incredible players as Style Scott and Charlie Eskimo Fox, as well as three vital soul-in-the-echo-chamber interjections from the late, great Bim Sherman. Essential early-80s dub damage. Mastered from the original tapes.